Get the party started with 4FunParties, online at 4FunParties.com. 4FunParties carries a wide selection of party decor, kits, goodies, and more. Planning a themed event for the holidays, the workplace, or a birthday? 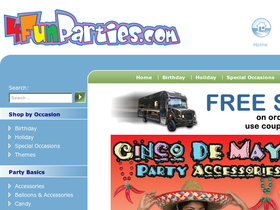 4FunParties has the hats, noisemakers, gift baskets, candy, banners, and decorations to make the party a success. 4FunParties also personalizes products such as candy bar wrappers, party favors, pens, and banners to add that extra pizazz to your party. Choose 4FunParties when planning the next football game get-together, anniversary party, or bar mitzvah. Be sure to drop by RetailSteal.com first for the latest and greatest 4FunParties coupon codes, 4FunParties promotions, and 4FunParties discounts. Choose from a variety of fast and affordable shipping and handling options. Select standard shipping that will take up 6 business days and costs depending on the price of your order ranging from $7.95-$19.95. Also available is 3 day ground shipping, 2 day air, next day delivery, Saturday shipping and international shipping. Check website for full details, exclusions may apply. Use this coupon code online at 4FunParties.com and save 10% off any purchase. Act now and enjoy a $20 discount on your order of $200+ with this coupon code from 4FunParties.com. Spend $49 or more at 4FunParties to get free shipping with this coupon code. Save $10 on your purchase of $100 or more from 4FunParties when you enter our coupon code online at checkout today. Shop the closeout party supplies on 4 Fun Parties and you can save up to 60% on a huge variety of items including tableware, decorations, toys, costumes, and more. Get $5 off your online order of $50 or more at 4FunParties. Click link for savings. Save 20% on your 4FunParties purchase with this coupon code! Shop at birthdayexpress.com and get free shipping when you spend $65 or more.